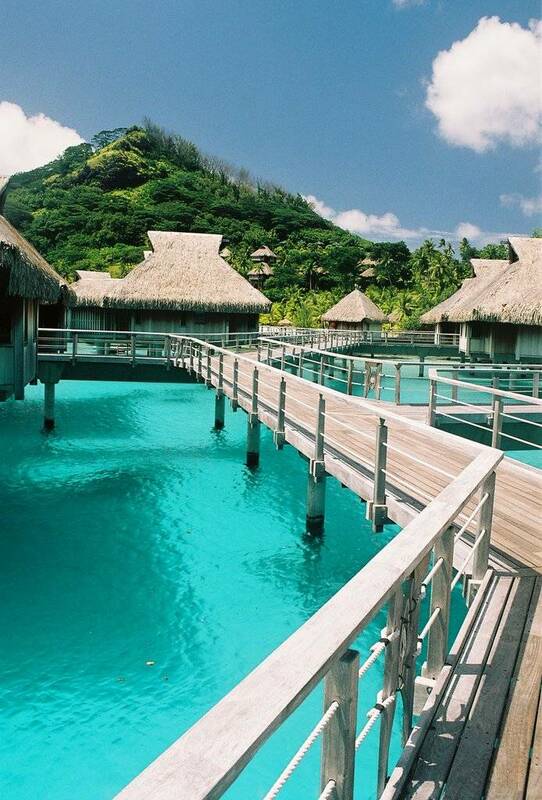 Suspended between turquoise waters and limitless skies, the Hilton Bora Bora Nui Resort & Spa is nestled in a sacred cove of white sand and majestic lava rock. Suspended between turquoise waters and limitless skies, this luxurious resort nestles in a cove of white sand and majestic lava rock. Here you will find a sensitive blend of authenticity and luxury in 122 suite-sized villa bungalows and a 30,000-square-foot hilltop Spa. Amazing new, two-story overwater Presidential Suites, are a first for the islands – complete with 3,400 square feet of special features like a private plunge pool on the deck, a choice of two bedrooms and a sleek bathtub-with-a-view. With its picture perfect hillside setting, the resort combines luxury with hand-crafted materials like carved kahia & coconut wood, roof thatching woven on the island, tapa cloths pounded from the breadfruit tree and chandeliers made from Tahitian black pearl shells. The hotel also helps to protect the sensitive local environment by using a Biorock biological purification system and taking energy from solar panels.